Katrina Sedgwick, the head of ACMI. Photo: Chris Hopkins. 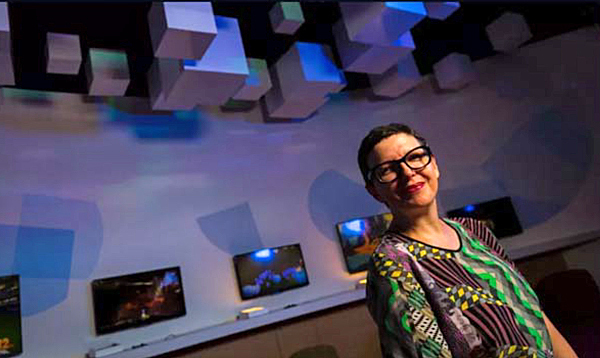 It is an exhibition space dedicated to showcasing the latest innovations in film and digital arts, but rapid advances in technology has begun to make many of ACMI’s long-standing exhibits look out of date. So the Australian Centre for the Moving Image will get its first major revamp in its near 20-year history, including an overhaul of its interior and a renewal of its permanent exhibitions. The centre, at Federation Square, will shut its doors for about nine months from early next year while the works take place, and is due to reopen in late 2019. The Andrews government announced on Wednesday that it had committed $31.6 million in the 2018-19 budget towards ACMI’s latest transformation. The overhaul follows the government’s decision this year to strike a deal with tech giant Apple to demolish one of the original buildings at Federation Square and build a flagship Apple store in its place. But ACMI’s revamp will not mean any changes are made to the building’s facade, though there will be changes outside its Flinders Street entrance to create more greenery and improve pedestrian flow. Arts Minister Martin Foley said the renewal was the biggest in ACMI’s history and would improve the experience for visitors, by updating the centre’s exhibitions to include more recent innovations in digital technology. “This wonderful facility is being given a whole new lease of life,” Mr Foley said. The funding commitment follows $5 million ACMI received in the current budget. It will go towards expanding the learning centre to double the number of student visits, a digital preservation lab for film and digital content and a new audience lab for the screen industry to test its ideas. Katrina Sedgwick, ACMI’s chief executive, said the investment would enable ACMI to bring its permanent exhibition up to date, admitting the current one had been superseded by recent technological innovations. “That’s going to be a decade old in 2019,” Ms Sedgwick said. According to ACMI’s most recent annual report, 1.3 million people visited the centre last financial year.